Creepy-crawlies don't really register as an entity that needs to be protected. Those of us with misgivings or phobias about our multi-legged friends would prefer to have them out of sight, out of mind and out of the way, but many who dislike or fear such things as beetles, ants and spiders do not consider the ecological repercussions should an event actually wipe out an entire species. Unfortunately, since many people choose not put much stock into issues pertaining to bugs or other small creatures, the situation with honey bees has gotten a little out of control. Those who are allergic or unsettled by the thought of bees might be glad to hear that there will be fewer of them buzzing around flower gardens and unsuspecting perfumed individuals this summer, but this is in fact a very big problem for anyone who enjoys fruits, vegetables, flowers and other products that require pollination. 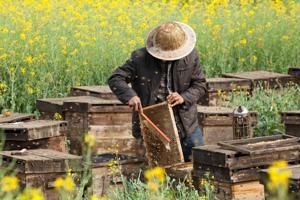 The major decrease in honeybees this year will lead to untold and severe problems for many industries around the world. Whether we want to admit it or not, we need bees. We need honey bees so earnestly, because 30 percent of everything we eat needs an insect to pollinate it, and that insect is almost always the Apis, or honeybee, reported Forbes. These little farmers travel from plant to plant, minding their own business and making it possible for us to operate multi-billion dollar industries based on their activities. Over the past few years, however, these precious little resources have been rapidly disappearing. In an interview with National Public Radio, beekeepers reported that they lost nearly half of their colonies last summer. While it's common for some bees to die off in the colder winter months and the arduous working months of spring and summer, these new numbers are unheard of and could very well lead to issues in agriculture. While we have been assured that honeybees are not going to be going extinct any time soon, we will probably see an increase in price of some of the goods that rely on honeybee pollination. Manufacturing.net noted that bees add $15 billion to the United States economy each year, so what can we do to protect these buzzing boons? Experts have been speculating for quite a few years about what could be causing colony collapse disorder, the name of the phenomenon behind the disappearing bees. At first, people blamed the pesticides and other chemicals that farmers put on their crops to keep harmful bugs at bay. However, Forbes noted that the experts are still not sure what exactly is causing all these bees to die off. Scientists have also considered shortages of the nutrients and pollen that bees need to survive. The source indicated that humans plant row after row of crops but don't bother with wildflowers, which sustain bees for longer. Thought the specific cause or combination of causes is still unknown, we can be sure that the honeybees are no longer buzzing in abundance due to human interference. Moving forward, we should try to facilitate bee population growth by planting more wildflowers and using fewer chemicals on our plants. In the end, we could have healthier food, bigger gardens and more bees to make everything grow big and strong. Seems like this counts as a triple-win situation. How can unemployment fall but layoffs rise? Verizon buys AOL for $4.4 billion...Really? Car recalls: Supply chain to blame? Is it time for a supply chain makeover?